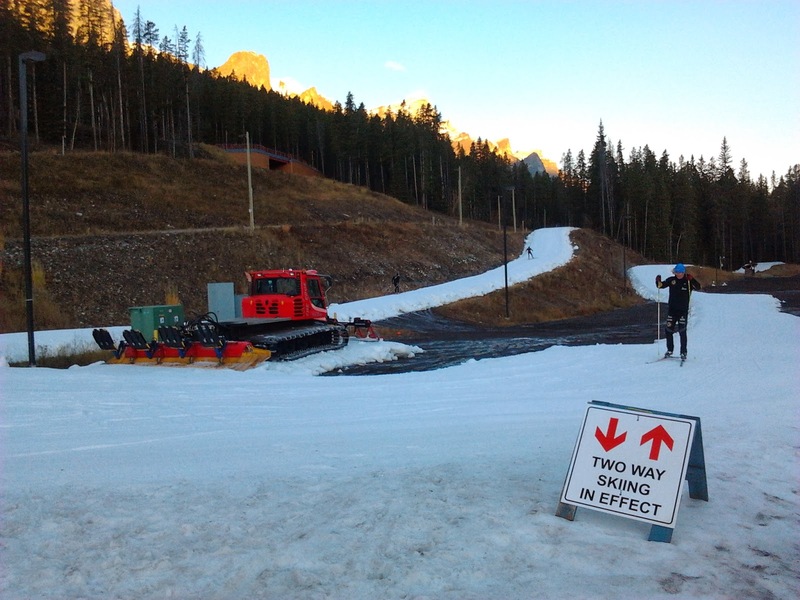 To the excitement of skiers all across North America, Frozen Thunder was spread out the weekend of the 19th in Canmore! For those of you unfamiliar with it, Frozen Thunder is the name given for the 2+ km ribbon of snow which is spread out mid-October at the Nordic Centre. The snow for the loop is stored under wood chips all summer long only to be revived from its dormant state mid-October–with the help of dump trucks, piston-bullies and an excavator. 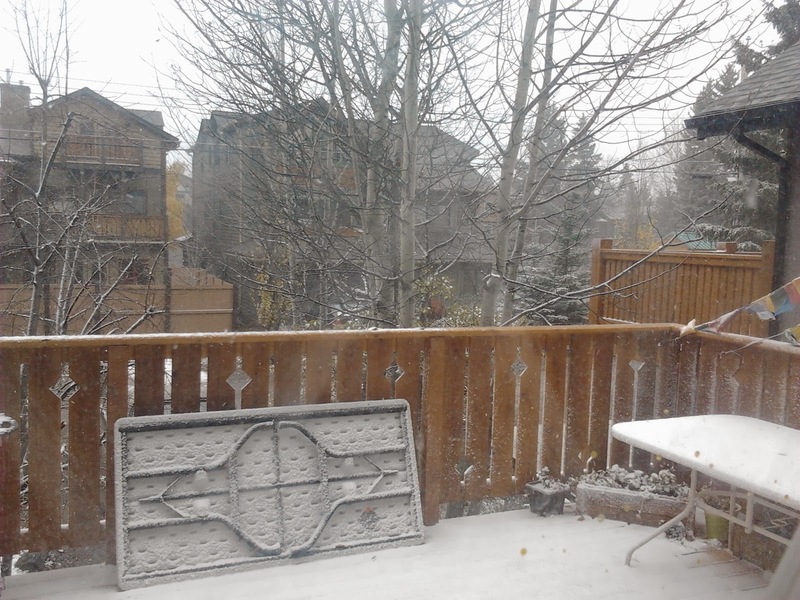 The really cool thing about it is that, being one of the first early-season opportunities to get on snow in North America, Frozen Thunder has become more than just a short loop of ski trail–it’s an event. 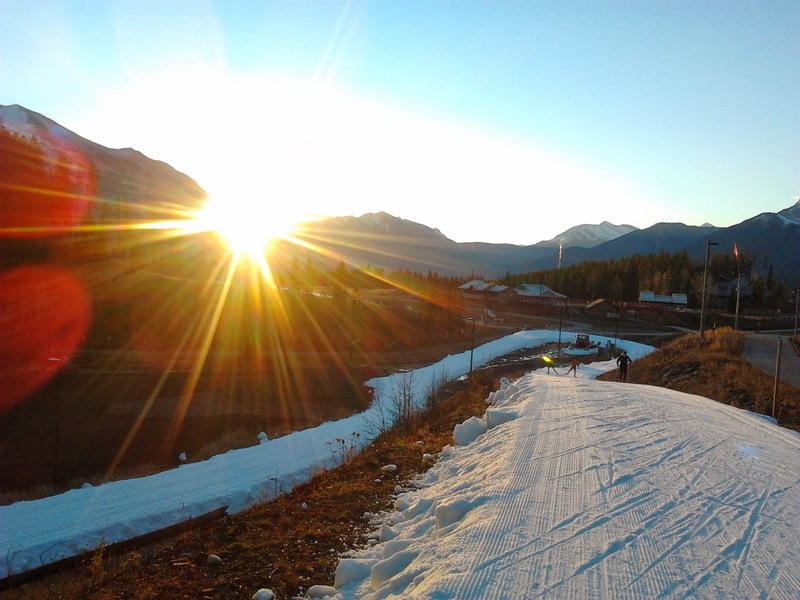 Top skiers from all over North America flock to Canmore to ski on the loop and, with the help of the annual Frozen Thunder sprint race, an air of festivity has developed around this little bit of groomed snow! Best time to hit-up Frozen Thunder is early in the morning (as pictured). Around 9am it gets super-busy. 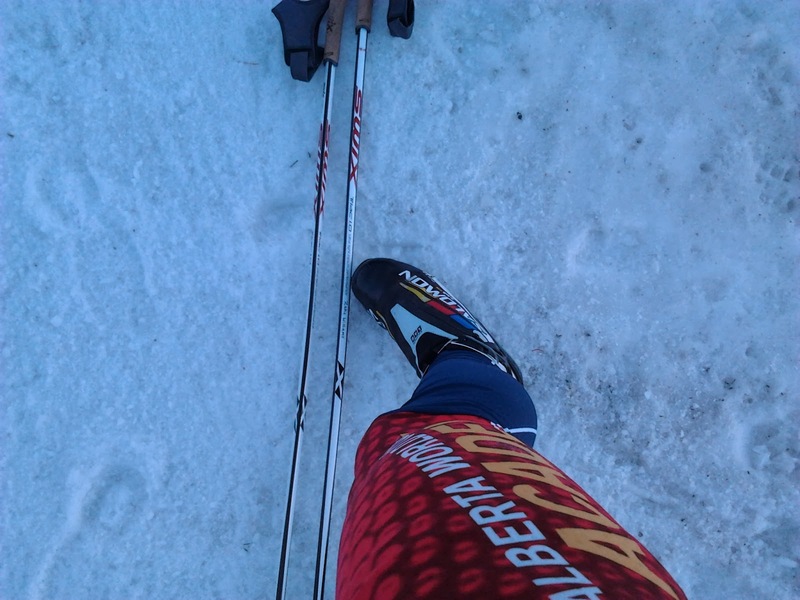 My Salomon and Swix gear making the transition from rollerskiing to on-snow with me! First, it led to me lying on my back on one of the Nordic Centre’s trails, contemplating the sky with a very sore lower-back and hip. Second, it induced a flurried activity of Physio visits. Next, it caused me to miss the first day of Frozen Thunder and to spend the next couple days focusing on double polling. In the middle of all this I decided to not put up a blog post last week because I was feeling kinda bummed about the whole situation (sorry!). Finally, I ended up skipping the Frozen Thunder sprint day last Thursday because I didn’t want to push my hip to hard. 1) I know it’s ridiculously cliché, but there is a positive in pretty much everything. Even when you can’t practice your sport physically, there are still many other things you can do to improve as an athlete. Search for the positive in the situation and see involuntary down-time as an opportunity to improve another side of your athletic performance. 2) Never loose sight of your longterm goals, especially when you’re working through an injury. The thing is, even if you miss weeks or months of training, it’s not going to affect where you want to be in your sport a few years down the line. This is pretty empowering knowledge when you aren’t well (and another great reason why you need to have longterm goals!). 3) The mind is extraordinarily powerful. If you can stay in a good place mentally throughout a time of injury or sickness, chances are you are going to heal much faster. The faster you can mentally overcome the disappointment of missed training the faster you will heal physically. Speaking of being healed, on Saturday I did classic skiing intervals on-snow on Frozen Thunder for the first time this Winter and my hip felt solid! With one month left until the first races of the season it’s time to put the icing on the metaphorical cake. Anyway, let them eat cake! !–I mean–Dream Big, People!! !